Nothing says you’re on vacation quite like an afternoon on the water. With Charleston’s sunny and warm weather and easy access to the ocean, it’s no surprise that boating is a popular activity for both locals and visitors alike. If you’re planning an East Islands Rentals vacation and looking for the best places for Isle of Palms and Charleston, SC, boat rentals, we’ve got you covered! Along with where to find the best Charleston, SC, boat rentals, discover the area’s top restaurants, shops, outdoor activities, and more with our free Vacation Guide. As locals of the area, we want to share with you our knowledge on how to make the most of your Isle of Palms and Charleston vacation! The Isle of Palms Marina accommodates all types of visitors with boats ranging anywhere from 16 to 25 feet. Rentals include dual consoles, center consoles, and deck boats. Each boat at the IOP Marina holds up to ten people and can be rented for half or full days. Explore the waters surrounding the Isle of Palms while you soak up some South Carolina sunshine or go fishing inshore along the Atlantic Ocean or Intracoastal Waterway. Be sure to make your reservations in advance as boat rentals at the Isle of Palms Marina fill up quickly! If you’re interested in a guided tour, the marina offers dolphin watching Harbor tours, Capers Island tours, and custom excursions (available upon request). Contact the Marina to schedule your boat excursion! For Charleston’s top private sailing charter and boat rental in Mount Pleasant, SC, spend a day with Om Sailing Charters. You’ll set sail on the beautiful 2005 Leopard 43′ Catamaran Sailboat, the fastest yacht rental on the Harbor. On your sailboat rental, explore the waters of the Charleston Harbor for three to six hours with up to six passengers. This is the perfect boat for a family trip, bachelorette party, or special occasion! SeaQuest Boat Rental is located at the Bristol Marina in Charleston, SC, and allows you to customize your own boating experience. Whether you choose to be your own captain or hire one, a SeaQuest boat trip will surely be a fun-filled adventure! You can opt for a four, six, or eight-hour trip. Advanced reservations are strongly encouraged as the boat rentals fill quickly! Charleston is known for its sunny weather, so any vacation to the area should certainly include plenty of time spent outdoors. Take a look at our blogs on where to find the best Isle of Palms jet ski rentals and bike rentals to discover more ways to get outside! After a day on the water with one of the best Charleston, SC, boat rentals, head to one of the area’s top restaurants for a delicious meal. Afterward, make your way back to your luxurious East Islands vacation rental to unwind. Whether you choose an oceanfront rental just steps from the beach or one of our gorgeous rentals with a private pool, you’re sure to have an outstanding, memorable vacation. 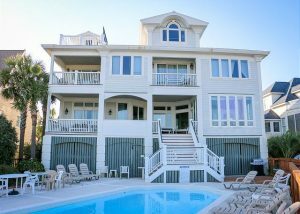 If you’d like to find out more about an East Islands Rentals vacation, browse our full list of vacation rentals and discover the best place to stay on the Isle of Palms. We’d love to host you and hear all about your Lowcountry adventures!